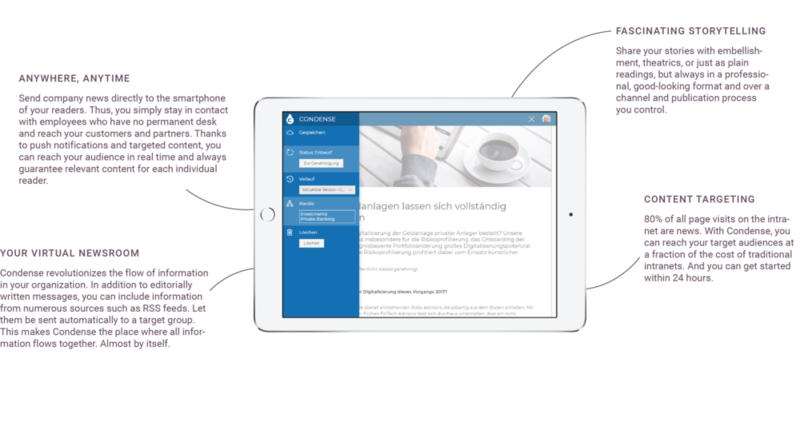 Condense is our lightweight mobile intranet service, which will revolutionize your communication. With Condense your front-line workers have everything they need delivered right to their phone. . Regardless of whether you would like to reach mobile workers in your company, members of your association, students and their parents of your educational institution or fans of your club, Condense is your effective channel – directly from the Cloud. Print? Disposal problem. Newsletter? Stone Age. Mass email? Spam. Captivate your customers with a customer magazine app. Maintain your dealer network and connect with your partners. Increase the connection and cooperation with them. Use apps for your internal communication – not the bush telegraph. With Condense, you can reach everyone. Inform your students via app and receive reading receipts in real time. Involve your members in the communication. Learn your members’ concerns and adjust the communication accordingly. Disburden your teaching staff and strengthen the cooperation between teachers and parents. 66% of media consumption is mobile today. About 80% is via apps. Do you already offer your content "To Go"? 55% of people under 35 infer the quality of your content to the performance of your business. Do your apps work for your image? 5x more coverage and sustainable engagement is achieved through regular publishing. Do you really keep going?